Spin the wheel and collect the symbols to win – then answer the questions to unlock the jackpot. 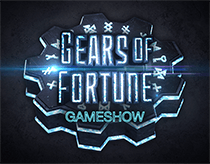 Gears of Fortune combines luck and skill as you collect symbols to win a prize of up to £1,000 based on a bet of only £1. Avoid the Hazards that will kill your Fortune! Before you start you have to define how much you want to bet. Define an amount and click the round "Start" button in the middle of the wheel. The paytable on the left of the game will tell you how much you can win by collecting which symbols. The wheel can be stopped by pressing "Stop" or waiting 10 seconds. Please note that the timing for when you hit "Stop" has no impact on which symbol gets selected, the wheel will always run out to the symbol determined by the Random Number Generator. A hazard symbol - this will be added to the hazard set at the bottom of your screen. If you collect 5 Hazard symbols, the game ends. A symbol of set 1-4 - the cash cog will fly to its position. If you complete a set, the game will end and you will be paid the corresponding payout. If you collect a Key symbol, you will be led to a question screen. Collect three different versions of each cog to win each jackpot. After each action is completed, you need to spin the wheel again. The draws take place 'on demand'. Therefore, notwithstanding anything in the Terms and Conditions, you will not receive a confirmation message in order for your bet to be valid. At the beginning of every game the pool of Jackpot Cogs contains 1000 cogs. Jackpot cogs can be won by answering questions correctly after stopping the wheel on the key symbol. There are twelve differing types of jackpot cogs that can be won which belong to four differing sets of cogs (Bronze, Silver, Gold and Platinum). In each set, the rarity of the cogs will be different . In each set the cogs are numbered from 1 to 3, as indicated by stars on the cog. At the start of the game, 1000 cogs are randomly distributed in line with the numbers indicated in the table. For example, for the platinum set there will be three types of cog. In total there would be 67 platinum cogs. The distribution of these cogs will be uneven. 33 of one type, 33 of another type and 1 of another type. We will distinguish these types by randomly assigning either 1, 2 or 3 stars to each cog type. Each game the rarest cogs in each set may have a differing number of stars on it. This does not affect the odds of winning the game. If a jackpot cog in a set has already been previously collected, all other gears of that particular type will be transformed into "Bonus Boosters". If you collect a Bonus Booster, all Jackpots increase by a set amount. Gears of Fortune is a game of chance with skill elements. Depending on how many questions you answer correctly you'll receive different average payouts. The following table describes your average payout based how many questions you will answer correctly. Keep in mind that even by pure guessing you will get an average 50% of your answers correctly. The questions for Gears Of Fortune are selected from a pool of 15000 questions. If you're playing as a guest only a subset of 1000 questions is used. All Questions have 1 correct answer and 3 incorrect answers, of which only one will be displayed, chosen by random. However, during a question phase, we'll have to assume you didn't answer it in time. All other phases are safe for a short break.